TAMPA, Fla. (WFLA) - On the night of January 20, 2019, celestial fanatics and stargazers will be treated to an amazing sight in the night sky. The first full moon of the month will occur that Sunday night. Early Native American tribes gave this moon the name Wolf Moon, in reference to the howling winter wolf packs. This Wolf Moon will be special, as it will be occurring at the same time as two other lunar events. On the evening of January 20, the moon will undergo a full lunar eclipse. This eclipse occurs when the orbit of the Earth passes between the sun and the moon. This alignment causes the shadow of our planet to be cast upon the moon giving it a distinctly red hue. The common name for the moon during this full lunar eclipse is the Blood Moon. This will be the last total lunar eclipse until 2021. So now we've figured out the "Wolf" part and the "Blood" part, but what about "Super?" 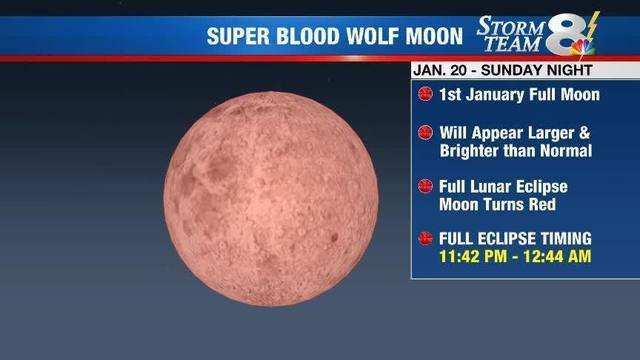 Well, this Blood Wolf Moon will occur when the moon is at perigee. Perigee refers to the point in the moon's orbit when it is closest to the Earth. To Earth observers, the moon will appear brighter and larger than normal. It is an amazing set of lunar events that will come together to create an amazing sight in the night sky. The full eclipse is expected to start at 10:41 p.m. CST and end at 11:43 p.m. CST.